Ten years ago a group of passionate NCTE leaders came up with the idea that writing deserved a national day of recognition. I was a participant in that first National Day on Writing. It was then and continues to be such an important spark for the nation. That’s why this year we challenged ourselves to stretch even further in recognition of this notable anniversary. In celebration, we have gathered resources and support from teachers, students, authors, publishers, nonprofit organizations, and even a film studio. It’s been energizing and fun to pull together so many new opportunities for members. Here are some snapshots of what we’ve been up to. We look forward to seeing what you and your students bring to the event next week! 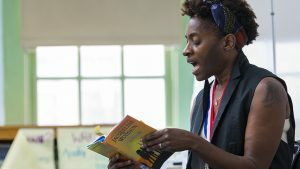 We traveled to School of the Future in New York City at the start of last week to film a visit with Jacqueline Woodson, National Ambassador for Young People’s Literature. 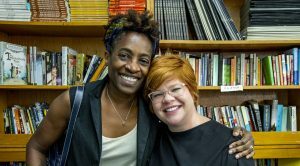 She spent an hour in NCTE member Lakisha Odlum’s class, where she talked about the power of writing to create change. The video from that visit will be shared later this week as part of a set of resources teachers can use to host a write-in with their classes around the National Day on Writing. Sign up today to receive notification as soon as the resources are released! Thank you to School of the Future for having us! Jacqueline Woodson reads from Harbor Me. 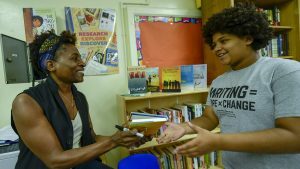 Jacqueline Woodson signs books for students. Thank you for joining us, Jacqueline! NCTE staff and members visited all 100 Senate offices to make a pitch for cosponsorship of S.Res. 653, in honor of the National Day on Writing (introduced by Senator Roberts [R-KS] and Senator Casey [D-PA]). We were warmly received and expect the resolution to be voted on in the coming days. We were joined on the Hill by our 2018–19 Williamson Policy Fellow Grace Lee, an English language arts teacher at Hinckley-Big Rock Middle School in Illinois. She and I met with a handful of legislative offices to reintroduce our policy priorities. 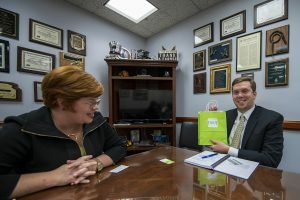 Emily Kirkpatrick meets with Flin Hyre from Senator Roberts’s office. 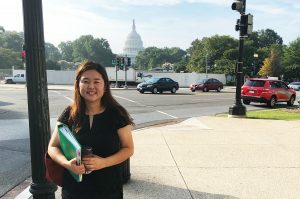 2018–19 Williamson Policy Fellow Grace Lee joins us in DC. 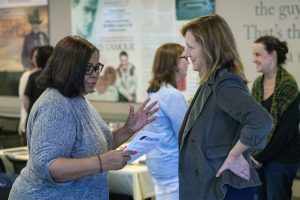 On Sunday night, NCTE members got to sit down at their kitchen tables with bestselling author Angie Thomas. 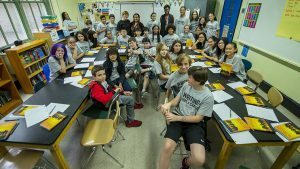 In a discussion facilitated by NCTE President Jocelyn A. Chadwick, Thomas talked about The Hate U Give movie and answered questions from the audience about her writing process, gave advice for tackling challenging topics in the classroom, and provided a sneak peek into her new novel that comes out in February 2019. Fox Searchlight Pictures and BazanED supported us in making this event possible. 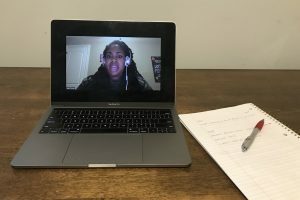 NCTE President Jocelyn A. Chadwick interviews Angie Thomas. A screenshot from the conversation. 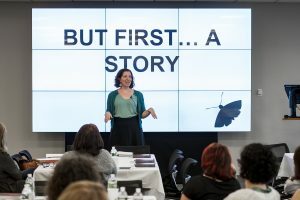 On Monday, NCTE members visited the Penguin Random House Headquarters where they explored the possibilities of oral storytelling with one another and discussed the implications for their classrooms. 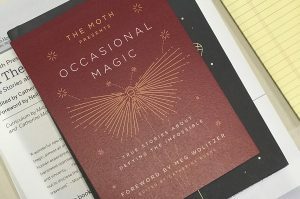 The workshop was facilitated by members of The Moth education team. 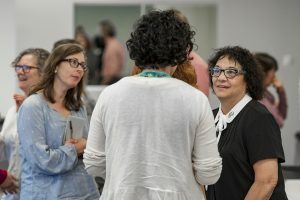 NCTE members learn with The Moth. The events kicking off the month of writing were exciting and wonderful because of the members who took part in them. These events were made possible through partnerships we’ve been working to cultivate to support our members, and we look forward to many more in the near future. We’re just ten days away from the 2018 National Day on Writing, and we can’t wait to watch and learn from celebrations all across the country. Make sure you share your events and tag your posts with @ncte and #WhyIWrite so we won’t miss them!